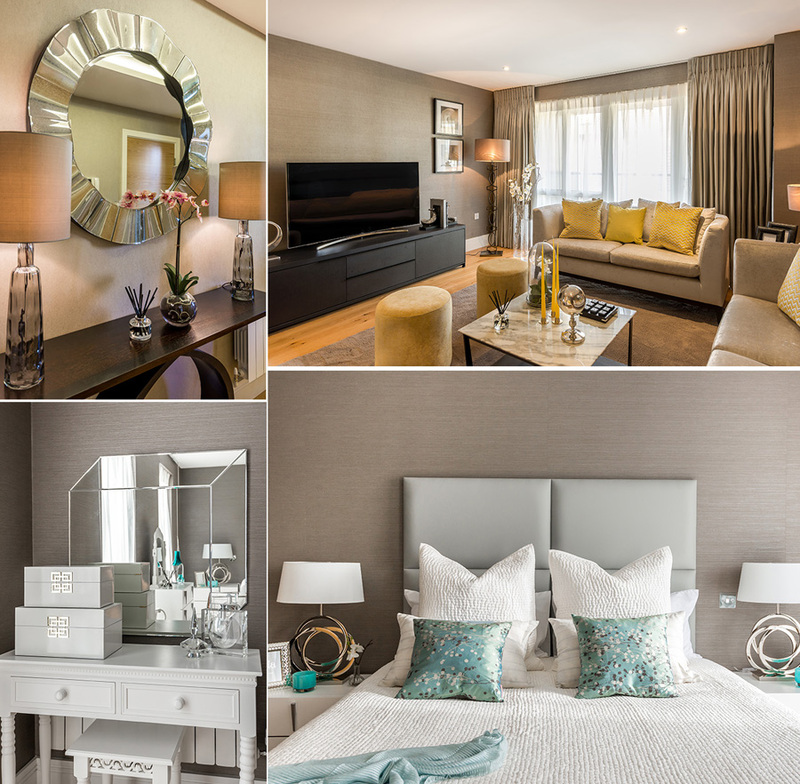 Following a recommendation from another satisfied client the ani M INTERIORS team was approached to transform a three-bedroom townhouse in Napier Square. The clients wanted a beautiful, yet practical family home that they could enjoy with their three teenage children. It had to be comfortable, relaxing and welcoming. The client had a clear vision of what they wanted to create. Overseen by Max Prychidko (Head Designer) and Amar Tufail (Business Development Manager), the property was given a refresh throughout the three bedrooms, two bathrooms (one an en suite), kitchen and a formal reception room, with particular attention paid to the formal reception room, entrance hall and master bedroom. As the property is a high-spec new build, it just needed the designers’ skill to redecorate and source bespoke furnishing. In consultation with the clients, the team prepared detailed mood boards and a space plan. For the formal reception room, the plans had to take into account the client’s love of entertaining. To that end, a flexible arrangement of seating was suggested, in the form of two sofas, two occasional chairs and two additional cube stools, meaning guests would be able to relax in comfort. The room was wallpapered with muted grey textile partnered with plush velvet for the couches, seats and cushions. This use of fabric for both the walls and soft furnishings creates an ambience of luxury. 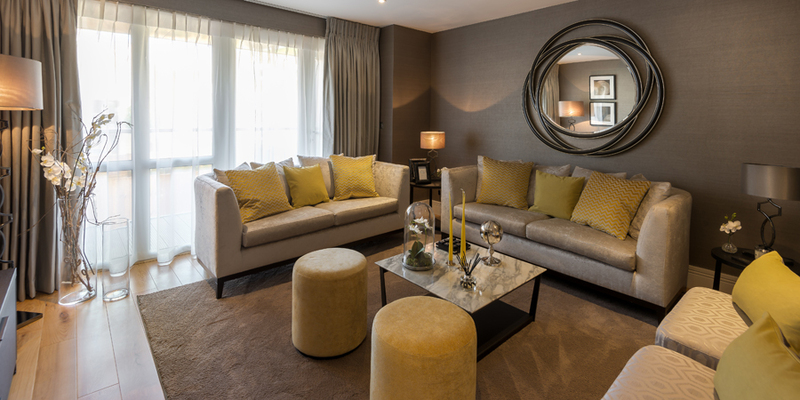 The grey tones bring an air of formality so the team accented with citrine to add warmth. A marble-topped coffee table was chosen to complement the rich furnishings, adding statement interest with its natural patternation. The large kitchen was the next focus, but because of its constant use as a family room, the furnishings and décor had to be practical. A deep corner sofa was chosen in a herringbone cotton fabric. This would be both hard wearing and comfortable for the client and their children to use while relaxing. 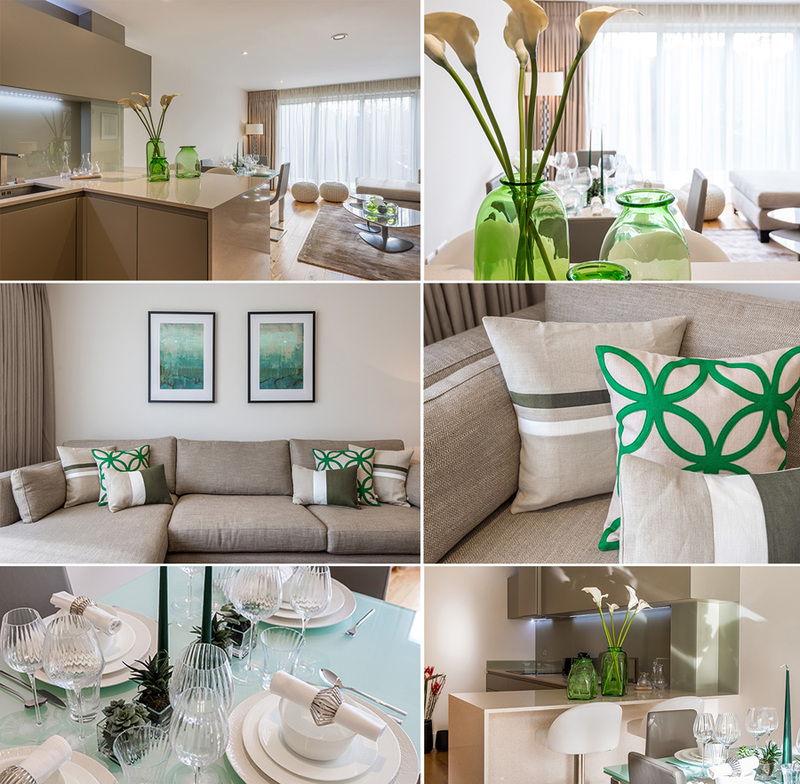 The colour scheme was light, bright and clean with fresh accents of emerald green to bring the outside space in. The master bedroom too was kept fresh and light. 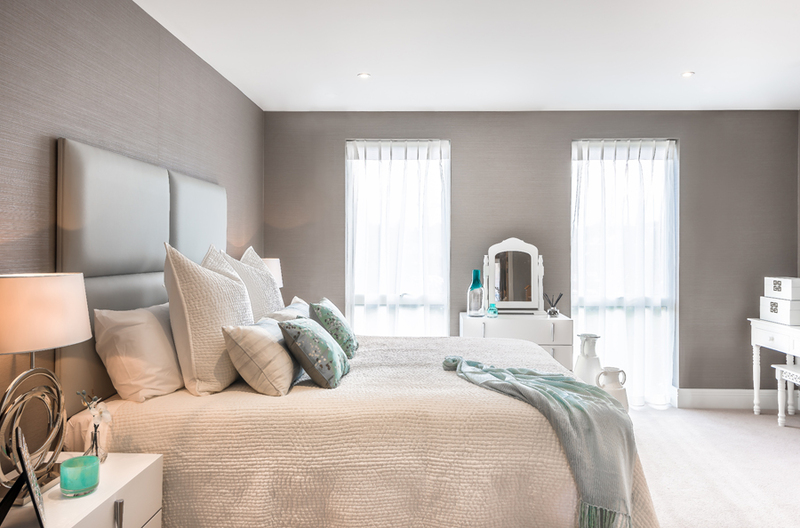 This time white furniture was paired with tones of grey and accessorised with pale blue to bring tints of the sea. Sometimes, with a modern property, the structure can feel a little stark and new so the team employs clever design techniques to soften the space. One such technique is using a textured vinyl wallpaper to help give a timeless feel. A classic chevron design on the main curtains also helped break up hard lines. Finally, a grand statement hallway. This time the walls were covered with a textured paper in a mottled finish. The champagne colour helped offset the dark stairwells while the mottled finish contrasts well with the sheen of the glass and mirror accessories. 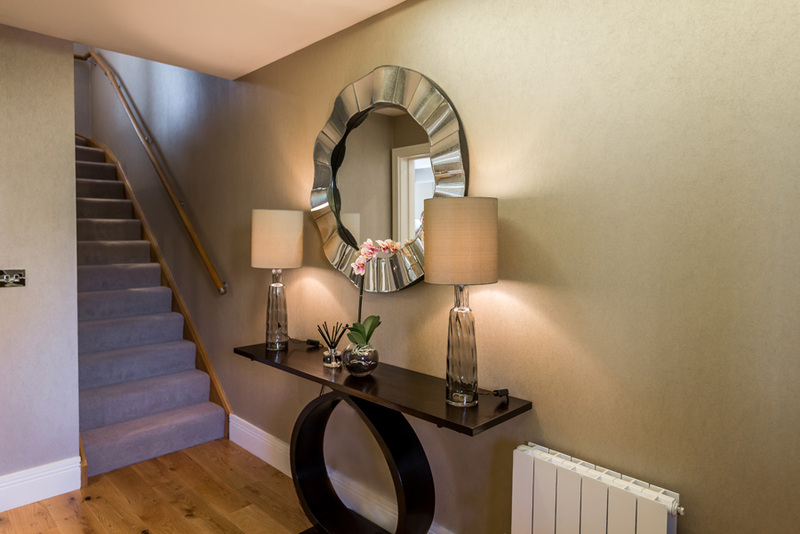 The bespoke console table took pride of place and showcases the hand-blown glass lamps. Why not consult the team about an interior design project for your home and see how we can delight you?